"Public policy today rejects constitutional government for HOAs allowing them to operate outside the law of the land. The policy makers have failed to understand that the HOA CC&Rs have crossed over the line between purely property restrictions to establishing unregulated and authoritarian private governments." "The HOA legal scheme as set forth in the governing documents and pro-HOA state laws, does not contain a fundamental principle of our constitutional system of government: checks and balances. The HOA board basically has, for all practical purposes, a free hand to function as an authoritarian government. The choice then falls onto each member to choose to follow his conscience either as a public citizen or as a HOA member citizen." See Rigged HOA elections create a false democracy; and see Civic responsibility vs. HOA member responsibility. “His knowledge is sophisticated . . . [Staropoli] has been able to articulate the deficiencies and the pending bombshells contained in the Legislature’s denial of the obvious: that the HOA system is badly broken and in desperate need of an overhaul.” Neighbors At War!, Ward Lucas (2012). HOAGOV Education Series: understand the real lives of HOA members. Visit Education. "When men who understand what is happening . . . when such men do not object or protest, men who do not understand cannot be expected to." Milton Mayer, They Thought They Were Free, 1955. This work is licensed by George K. Staropoli under a Creative Commons Attribution-NonCommercial-NoDerivatives 4.0 International License. SEE AZ Attorney General admits SB 1454 HOA to be invalid and without effect and court holds HOA provisions unconstitutional in 2013 lawsuit, Staropoli v State of Arizona, CV2013-009991. 1. Will the real CAI standup: its contradictory beliefs, pronouncements and goals. 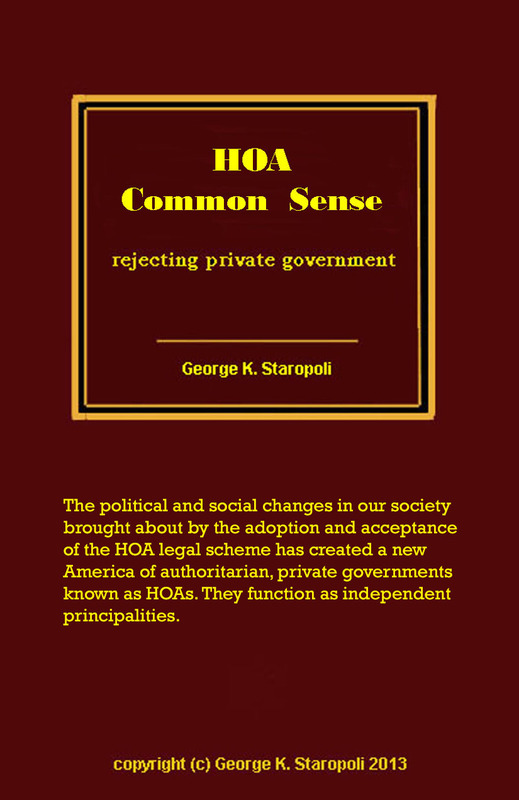 For a down-to-earth look at the HOA legal scheme, read HOA Common Sense: rejecting private government. Download from Amazon for KINDLE. Also serialized on HOA Constitutional Government. The HOA Vortex, above, shows the substantive defects in the HOA legal scheme and structure. Definition of HOA-LAND: HOA-Land is a collection of fragmented independent principalities within America, known in general as “HOAs,” that are separate local private governments not subject to the constitution, and that collectively constitute a nation within the United States. For more see, Defining HOA-LAND: what it is. HOA-Land Ethics for the Board: "You can technically obey the law and still be at fault. That's ethics." 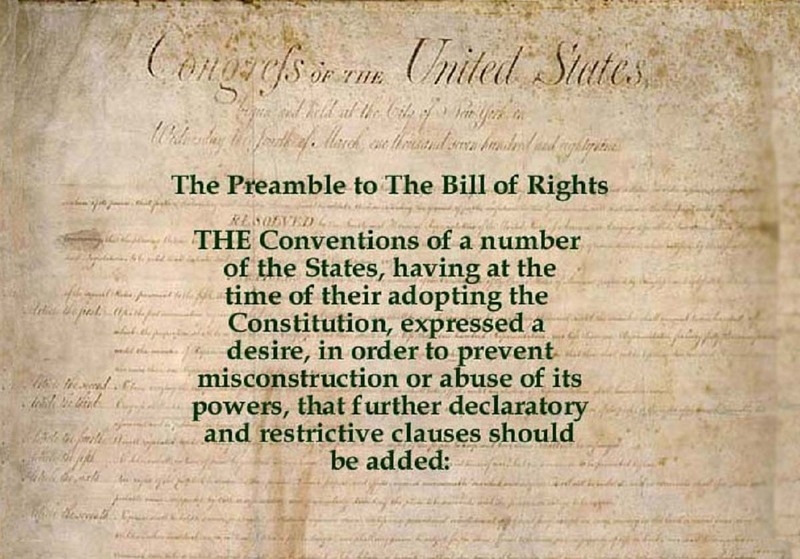 The association hereby waives and surrenders any rights or claims it may have under law and herewith unconditionally and irrevocably agrees 1) to be bound by the US and State Constitutions, and laws of the State within which it is located, as if it were a subdivision of the state and a local public government entity, and 2) that constitutional law shall prevail as the supreme law of the land including over conflicting laws and legal doctrines of equitable servitudes. An excellent guide for citizens seeking to effectively lobby their legislature to bring about desired change by Colorado Senate Majority Leader Morgan Carroll. See review of Take Back Your Government. Another "must read" is The Social Dynamics of HOAs: Why do people harm others in HOAs. "If angels were to govern men, neither external nor internal controls on government would be necessary." James Madison, The FederaliThe Federalist papers, # 51. And even more so for private HOA governments. And the Land Shall Be Made Good Again a poetic retelling of the New America. The HOA Warrior defending homeowners against associations", wrote The Arizona Republic . Background info on George K. Staropoli, Pres. · Citizens for Constitutional Local Government (CCLG) believes that HOAs are independent, undemocratic, private governments operating outside the American system of government. If we are to make progress, we must distinguish the concept of a planned community, which is a real estate "package" of homes, landscaping, amenities, and rules, from that of the HOA, which is the governing body of the planned community. Only when the HOA is a truly democratic government and no longer an independent, private government will there be equality for all citizens. For more information on Arizona, click on the button. While Arizona advocates won a victory, see a video on how homeowner rights advocates had to fight for this success. See news video. Collected Papers: Constitutionality & Legitimacy of HOAs. See Phoenix ABC15 TV expose on Controlling HOAs (click on Controlling HOAs under Investigative Reporters). For more: opinion (pdf) appeals brief (pdf) CAI amicus brief (pdf) Response to CAI (pdf). Twin Rivers Amicus brief filed by AARP. View homeowners' NJ Supreme Court brief (82 pages, 4.1 MB, PDF). The NJ Supreme Court heard oral arguments in the Twin Rivers appeal on Jan. 4, 2007. View history of decisions here . Read about the hidden history of planned communities, and the role of the national HOA lobbyist, Community Associations Institute (CAI), in opposing constitutional protections for homeowners. -- Why not local government? -- HOAs as an unincorporated town? -- Private Government HOAs are Defective. -- You can be held to anything, including additional financial obligations not related to the purpose of the HOA, without your vote. Read more about California Appeals Court decision. -- HOA vs Civil Governments Govt. -- Open Letter to Arizona Legislators file.